Meet: Manchester Museum Reception, Chorlton-on-Medlock, 12 noon. He broke the Nazis’ Enigma code, almost invented the computer, and was persecuted to a painful suicide by the ungrateful authorities. Alan Turing was a tortured genius and modern martyr who posthumously received an official government apology from prime minister Gordon Brown in 2009. 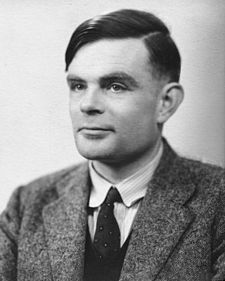 Back in 1948 Alan Turing discovered to his chagrin that mathematicians at Manchester University had beaten him into building the world’s first programmable computer. He contacted the department and had little difficulty convincing them he should be hired for he had enjoyed an excellent war, heavily involved in cracking the supposedly uncrackable codes that the Nazis had encrypted into their Enigma machine. Turing had been a maths prodigy as a boy. At the age of 14 his first day at Sherborne school coincided with the 1926 General Strike. So determined was he to attend school, he biked it 60 miles to the school, stopping overnight at an inn. At Sherborne he developed an interest in the latest mathematical philosophies, in particular Bertrand Russell’s paradox: “the set of all tea cups is not a member of itself, but the set of all non-tea cups is”, its beautiful and simple resonance so influential in the development of logic as a science. It all went wrong for Turing in the 1950s after he picked up a boy at the Regal Cinema on Oxford Street (now the Dancehouse Theatre) and took him home. The boy allegedly tried to blackmail Turing, and the mathematician went to the police. When they discovered that there had been a (then illegal) homosexual relationship between the two men they turned the tables on Turing and prosecuted him for gross indecency. His conviction led to the removal of his security clearance at a time of public anxiety about spies and homosexual entrapment by Soviet agents. He was forced to take hormones to “cure” him of his sexual leanings which made him grow breasts, and on 8 June 1954 Turing’s cleaner found him dead. The cause was established as cyanide poisoning. 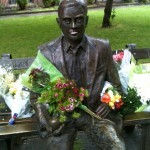 Alan Turing was cremated at Woking; his life-size statue occupies pride of place in Sackville Park, where we end the tour. • Many thanks to Jury’s Inn, Manchester, for supporting our tour. Here is their excellent tribute.